Bird Photography at Hunter Wetlands Centre, 30th May, 2009. This afternoon I went to the Hunter Wetlands Centre at Shortland. The weather has been horrible all week and today has been my first chance to get out to photograph some birds. There was not many birds around and it rained a couple of times while I was out and about. There were the usual waterbirds such as Magpie Goose, Eurasian Coot, Purple swamphen, Dusky Moorhen, and Australasian Grebes. The good old reliable Whistling Kites were circling about looking for something to gobble down. 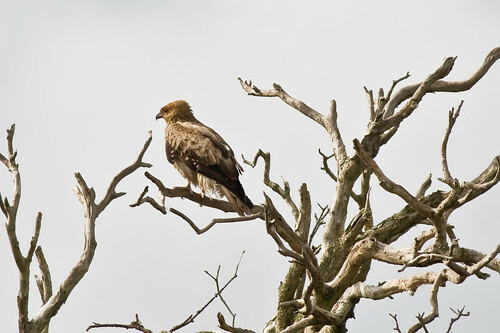 There was a pair of Whistling Kites sitting on dead trees at the south western end of the egret breeding pond. Here is one of them. 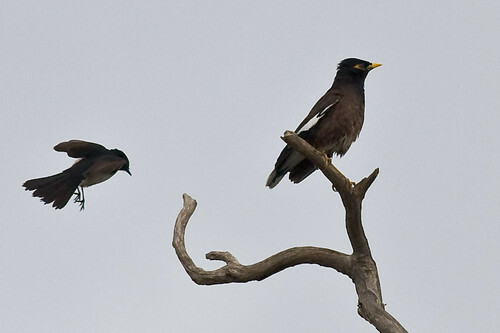 There was also a scraggly looking Common myna sitting on one of the trees. 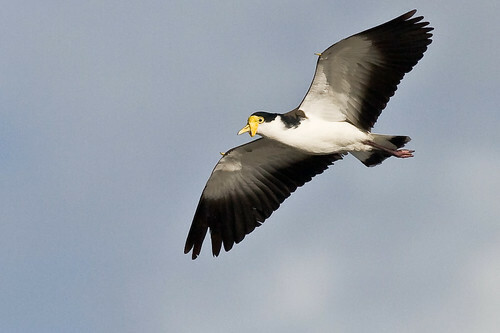 These birds are considered a pest in Australia and are not very well liked. I thought I saw a Brahminy Kite through the trees but I could not tell for sure and it did not come back. I have been wanting a good photograph of one of them for ages. One day, my Brahminy Kite will come. I ended my outing with a nice long black coffee at the cafe. Bird Photography at Belmont Lagoon, 28th May, 2009. This morning I went to Belmont Lagoon, which is just near Lake Macquarie, and feeds into it from Cold Tea Creek at Belmont South. Heading up along the creek, I saw a little egret trying to sit on the top of this casuarina tree and not being very successful, because it just bent, of course. Then I was hearing this cheep cheep sound and spied an Azure Kingfisher through the trees. I took a very blurry and dark photo and tried to get closer, even walking in the lagoon in my gum boots, but did not see him again. I would really love to get a decent photo of an Azure Kingfisher. One day, for sure. 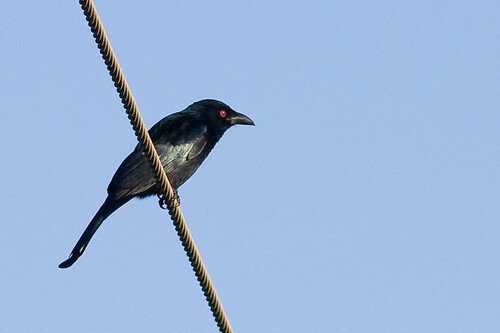 But I did get a decent shot of a Spangled Drongo perched on a telegraph wire. There have been a few around lately. There were a few other birds on the way down the creek such as Black-faced Cuckoo-shrike, a shag on a stick, Superb Fairy-wrens, and a few White-cheeked HOneyeaters, as well as mobs of the usual Yellow-faced Honeyeaters. 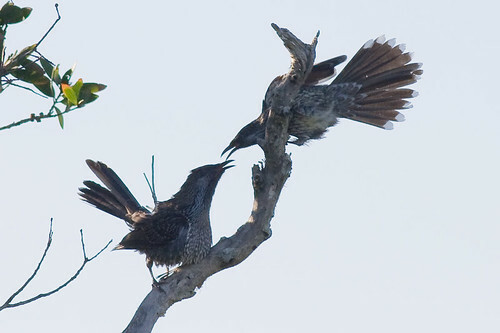 Then I spied a pair of Little Wattlebirds playing around, arguing and singing to each other. It was quite humorous. And here is one having a good old singalong. I went to the right at the end of the track, looking for some Southern Emu-wren, but no success. I came back and then went left towards the peninsula that juts into Belmont Lagoon. There were heaps of Red-browed Finch with a lot of Juveniles amongst them. 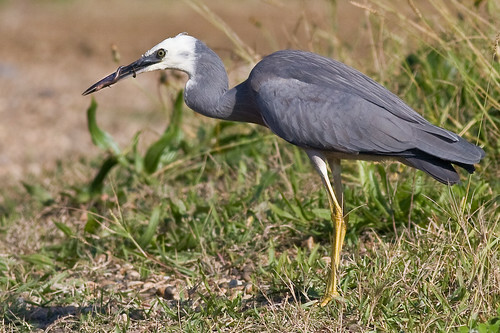 A Black-shouldered Kite flew past and then I spotted this White-faced Heron having a meal of a lizard. Bird Photography at Galgabba Point, 26th may 2009. This morning was very foggy and it did not clear up until about eight o’clock. So I did not get to Galgabba Point at swansea until about half past eight. 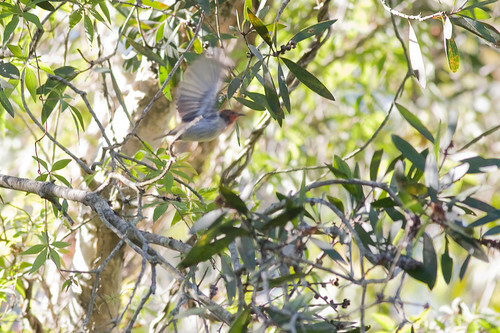 There were quite a few honeyeaters around including what I think was a Scarlet Honeyeater, but the photos were crap so I am not going to post them. The usual bunch of Bell Miners, Noisy Friarbirds, Yellow-faced Honeyeaters were causing a ruckus. The weather was a bit overcast so the conditions were not the best for taking photos. I headed further up the poing and came across a bunch of Brown Thornbills and got some decent shots at last. As I rounded the point ready to start back, this massive female White-bellied Sea-eagle perched on a tree next to the lake, and I walked very carefully a bit closer, but she must have spotted me and flew off. I was most disappointed. She was a huge bird. 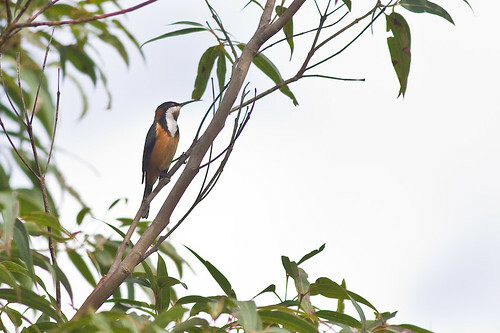 Just before I finished my walk, as is per usual, I spotted an Eastern Spinebill that was flitting around a low tree. They are quite an impressive looking bird, and quite handsome. What do you reckon? Bird Photography at Kooragang Island 24th may, 2009. This morning I headed out looking for the Brahminy Kite, again. I did not see one, but saw an Osprey. The photos were a bit far off, but. Nevertheless, I had a great day and some some unexpected birds in some unexpected places. I started off at the eastern end of Kooragang Island. I just parked there and waited for something to come along, birds that is. 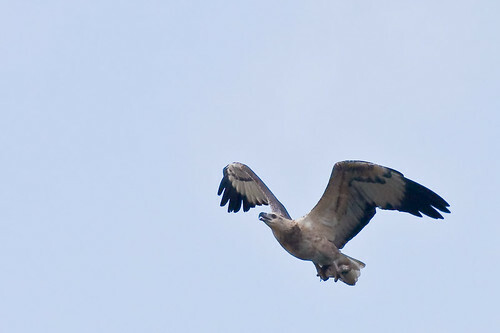 and hey presto, this immature White-bellied Sea-eagle came flying past with a big fish in its talons. He was also getting harassed by an Australian Magpie. I am guessing the the magpie was trying to make him drop it, so he could steal the fish. I saw a Nankeen Kestrel on a light in the distance, so I set off to get a bit closer. 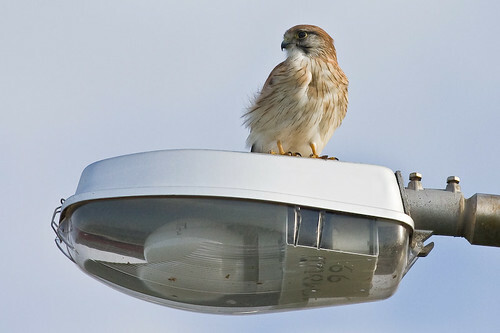 The kestrel stayed there until I got there and I took some photos of him roosting on the light. A couple of the shots were set against this industrial backdrop and they looked real ironic. But here is the one on the light. I walked back to the car, and saw a pair of Black-faced Cuckoo-shrike who were sitting on a mustard seed bush next to the river. It was weird and pretty well unexpected. And then I got a shot of one of them in flight. Even weirder. 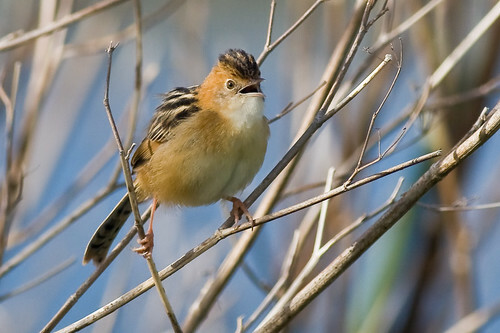 And there were a few Golden-headed Cisticola in the bushes, so I had to take some photos. This one was having a big whinge and hanging on to two branches all at once, count them, one two. I then went over the bridge to Stockton Sandspit and had a walk around. There were the same Eastern Curlews and Bar-tailed Godwits as yesterday. They are probably first year birds that are going to winter here in Australia and are not going to Siberia. It seems that the young ones do not migrate to Siberia until they are a couple of years old and ready to breed. It makes sense I suppose. There is not much sense flying all the way to Siberia if you aint gonna get a bit of loving. 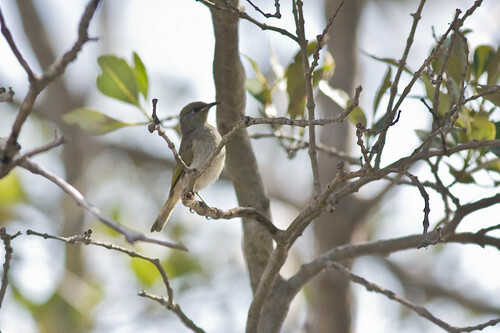 There were a few Brown Honyeaters in the mangroves at the northern end of the sandspit. I did manage to see a Whimbrel for the first time, and I spied the Osprey but it was too far away for a decent photograph. Bird Photography at Stockton, 23rd May, 2009. This morning the rain stopped and the sun came out in patches. So it was off to the Stockton side of the river to look for the fabled Brahminy Kite. Which I saw and photographed, but it was a bit too far away, but at least I saw it. I will get a closer photograph next time, for sure. I first went to the western side of the Northern channel of the Hunter River in the estuary. Nothing going on at all on the industrial side, so I went over the other side to near where the wreck is on the other side of the river. Not much going on there, either, so I went to the boat ramp and had a look. I ended up at the Stockton Sandspit and went down to the water’s edge. 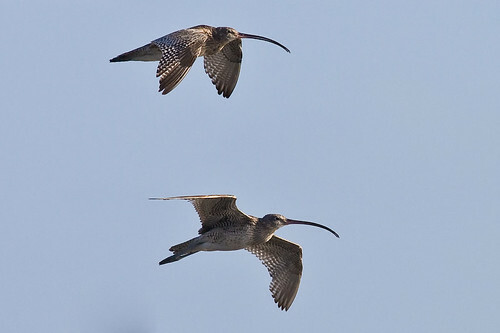 There were a bunch of Eastern Curlews flying around and roosting near a pond. I thought they would have been gone by now to Siberia. Maybe they are late leavers. There were also about fifty Bar-tailed Godwits still hanging around as well. They should have been off to Siberia as well. 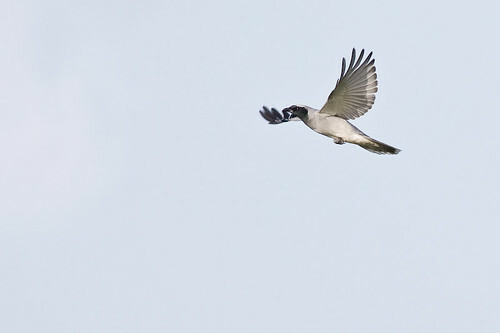 But there were the obligatory and argumentative Masked Lapwings that were carrying on as usual. 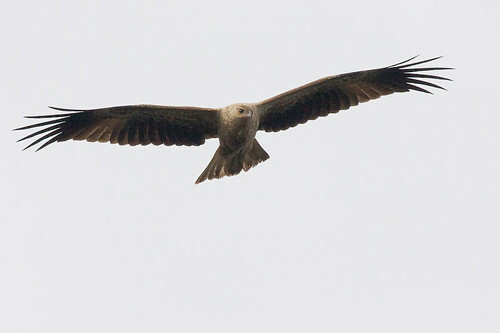 About this time I saw the Brahminy Kite coming across from Fern Bay and flew towards the other side of the river. I was hoping he would turn back and do a sweep a bit closer to me, but he did not. I got a few photos, but they were a bit far away. There is always tomorrow. 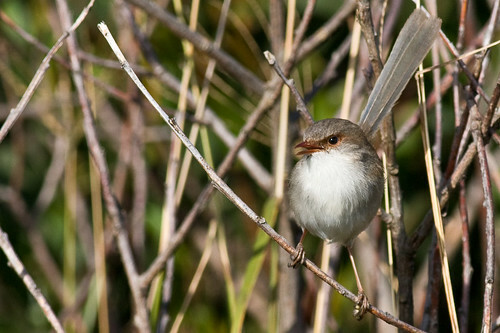 I carried on around the lagoon and saw a few Superb Fairy-wrens in the bushes on the way back. 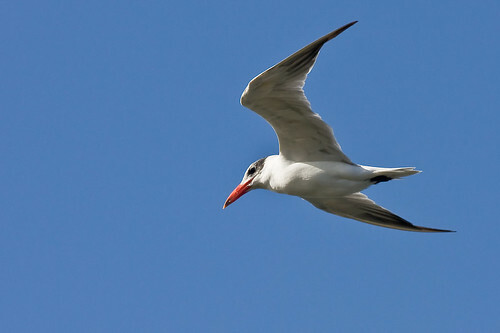 And at the car park I managed to snap this Caspian Tern. Hunter Wetlands Centre = Raptor Heaven. Once again the Hunter Wetlands Centre comes good with a lovely display of raptors today(20th May, 2009). There must have been more than half a dozen raptors there today. 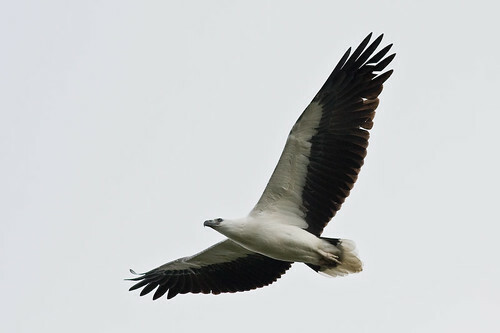 Three or four Whistling Kites, a pair of Swamp Harriers and a magnificent White-bellied Sea-eagle. The Hunter Wetlands Centre is at Shortland in Newcastle and you can be guaranteed at least a Whistling Kite or two every time you go there. Here is one sitting on a tree. The Whistling Kites were flying really low today over the swamps and even hiding out in the trees, perching on some very low trees. Maybe it was because there was a pretty strong wind blowing. This one has his frontal feathers flying in the wind. 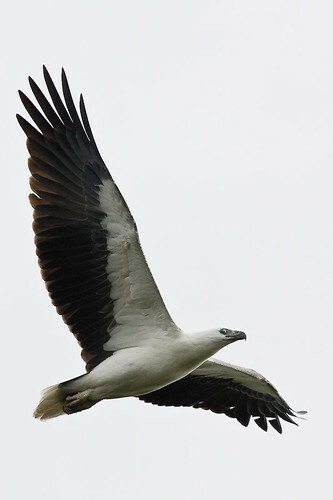 I got the shock of my life when a White-bellied Sea-eagle came flying over the trees right at me. You do not usually see them at the Wetlands Centre. Anyway, I was very happy to see him or her. And here he is again on his second whirl. It started raining shortly after and it was lucky that I was in the Egret hide. 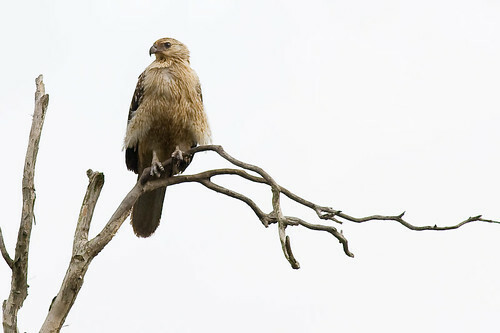 There were a few Whistling Kites in the Egret breeding ponds that were stuck out in the rain, roosting in trees. One of them was actually roosting on an old egret nest. I have no idea what he was doing. Bizarre. 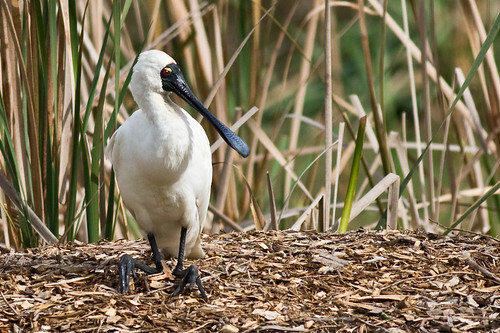 When the rain stopped I headed home and on the way saw a Royal Spoonbill on the land sitting or kneeling on his knees. I have no idea what was going on. This afternoon we went to Belmont Wetlands after Galgabba and Little Pelican. See the two previous posts for details. It was a big day. Belmont Wetlands is at the end of George street in Belmont and follows the old train line to Newcastle. The track goes through the old swamps that I used to wander around when I was a kid. Hopefully one day there will be a bicycle track on it that will go all the way from Newcastle to Belmont. At present the Fernleigh track only goes from Adamstown to Dudley and hopefully will be extended past Redhead to Belmont in the future. But let’s get on with the birds that we saw. Here is a new bird for me, the White-throated Treecreeper, which feeds mainly on ants, as well as insects and nectar. They prefer a habitat of eucalypt forests and open woodlands. The Scarlet Honeyeater is distributed throughout Eastern Australia. They have a habitat of coastal and range forests and usually follow the flowering trees. Scarlet Honeyeaters probe at flowers for nectar with its long slender beak while they are in mid-flight. I can’t think of a snappy headline, so I will just make one up that is totally stupid. 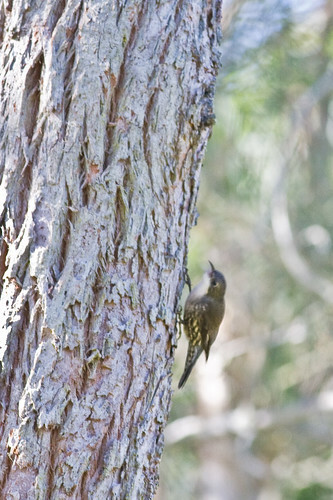 I am Cuckoo about Honeyeaters! Even more honeyeaters and a bonus Cuckoo just for being you. Later on, after the morning spent birdwatching at Galgabba Point(see previous post), we went to Little Pelican, which is over the Swansea Bridge, going North. I had never been to Little Pelican before. Here are the directions if you ever want to go there. Cross the swansea bridge, going north. There is a turnoff just after the Motel and before the Camping Ground. Just follow this road a few hundred meters and park any where you like. Follow the roads and just wander around the tracks there. Its very close to the Swansea Channel. 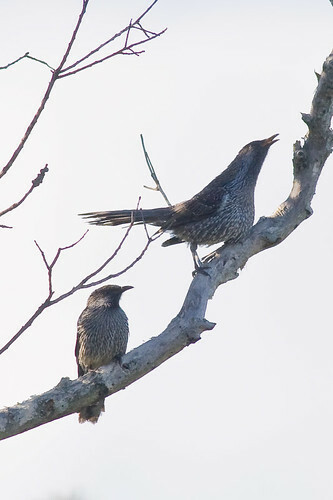 The Fan-tailed Cuckoo is distributed throughout much of Australia, as well as New Caledonia, New Guinea, New Zealand, and their favoured habitat is open forests and woodlands. They feed on hairy caterpillars, as well as other insects and larvae. They belong to Order: Cuculiformes and Family: Cuculidae. 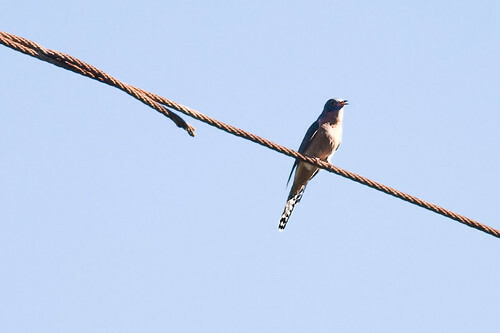 The distinctive features of the Fan-tailed Cuckoo is the tail which is dark grey with prominent white markings, and the breast which has a rufous shading. This was a first for me. We seem to be right on the edges of its distribution in Lake Macquarie. 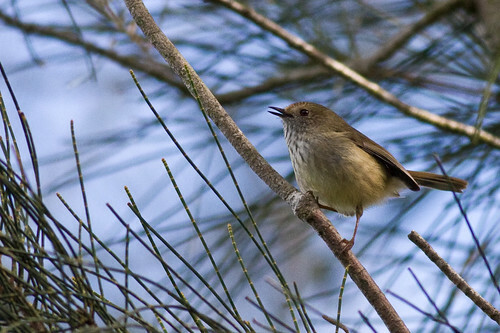 The Brown Honeyeater is also found in Indonesia and New Guinea. They also seem to prefer mangrove edges near the water and this one was certainly hanging out on the mangroves next to the channel. More Honeyeaters than you can Point a stick at. This morning there were heaps of honeyeaters around. “Heaps” is a technical birdwatching term. It means “lots”. Many of the trees are blooming at the moment so the nectar-feeding birds are in abundance. 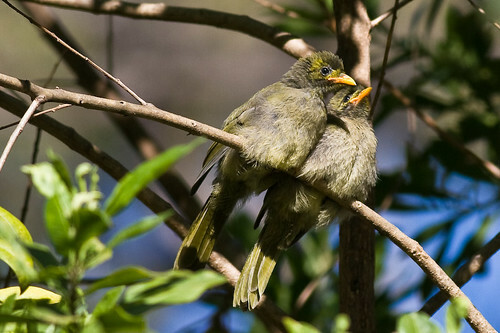 You have your standard honeyeaters, as well as the Noisy Friarbirds, and the Lorikeets such as Rainbow Lorikeets, Musk Lorikeets, and Scaly-breasted Lorikeets. Now that I have the grabber out of the way, on to the details of this bird photography expedition. I want to say thanks to Captain Jack for organising this little adventure. It was a survey to see if we could see any Swift Parrots or Regent Honeyeaters. These are rarely seen birds and this was part of a wider national survey to find out how many of these threatened bird species are around. Galgabba Point is at Swansea, on the eastern shores of Lake Macquarie, near Newcastle, NSW. The local landcare group/s have done a wonderful job in looking after the bush in this area, so many congratulations to all these hard-working terrific people. 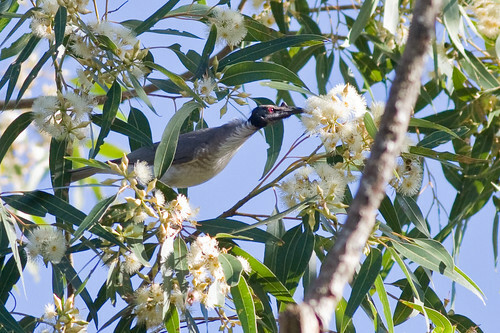 *Cheers* The first bird photo out of the box is the Noisy Friarbird, a regular contributor to these posts in the past week. 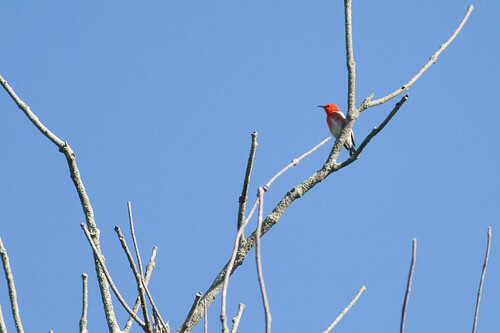 In all actuality, I think I only saw one of these birds today, so they weren’t that apparent on this outing. Next item on the agenda is the Mistletoebird, and here one is feeding on the mistletoe. 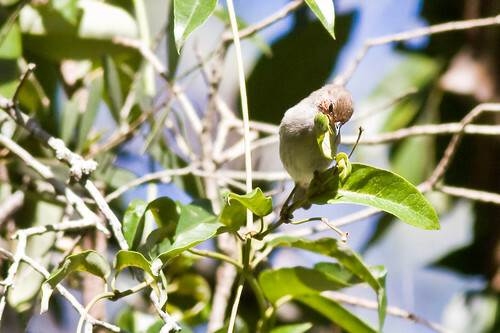 They eat the berries and also eat the fruit of other plants. They also feed on nectar, spiders and insects. As do most birds. The Mistletoebirds defecate the sticky seeds relatively quickly, which stick on the leaves of the plants, germinating later on. This behaviour is of mutual benefit to both the mistletoe and the Mistletoebird. 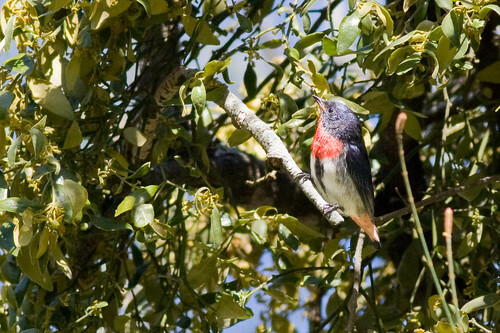 The plant gets efficient dispersal of the seeds, and the Mistletoebird guarantees a continuing food supply. The next bird is a new bird for me, the Scarlet Honeyeater. The Scarlet Honeyeater is an extremely attractive bird and stands out like a sore thumb. They are found along the east coast of Australia, as well as Indonesia and New Caledonia. There habitat is open forests and woodlands with an open understorey, sometimes in the vicinity of wetlands or rainforest edges. They move around with the flowering of their food plants. 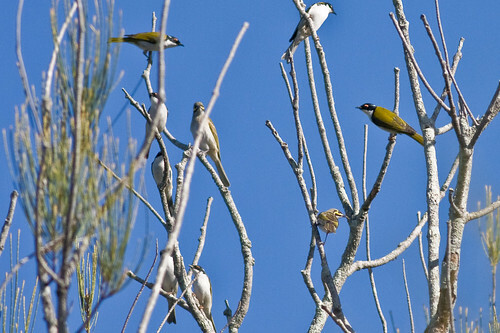 Here is a photo of a heap of honeyeaters sitting in a tree. They seem to fly around in big batches and then disperse. 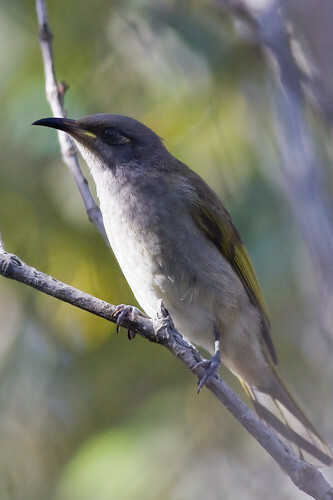 There are White-naped Honeyeaters in there as well as the more common Yellow-faced Honeyeaters. There were quite a few Bell Miners around at one spot, and they were flying around quite aggressivly trying to fend off the other honeyeaters and defend their territory. You could see quite clearly the dieback in the trees where they had their colony. Here are a couple of immature Bell Miners who were huddled up together. 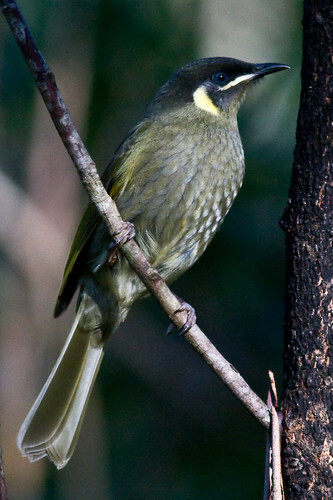 And last but not least, the Lewin’s Honeyeater. They are found in both rainforests and wet sclerophyll forests and feed mainly on fruits, but also eat insects and nectar. Well, I thought yesterday was a crummy day that turned out to be not so bad, but today was the absolute pits. Almost. So let us start this tragi-comedy, this Beckett reworking of Waiting for Birdot. This morning I went over to the Stockton side of the Hunter River in Newcastle, NSW. 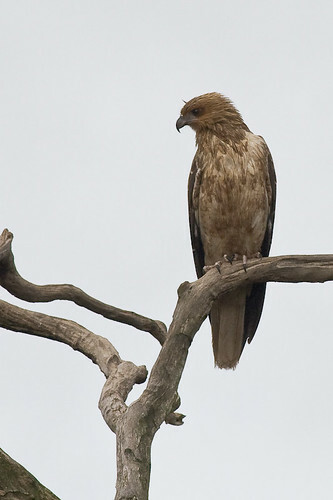 I was hoping to find and photograph a Brahminy Kite that I had been told was seen there during the week. The day was yucky and windy and freezing cold into the bargain, so it was not a good start. 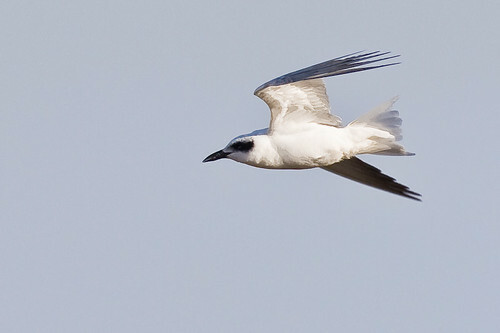 So, I went on the western side of the river, along Kooragang Island, and saw a few terns and cormorants. Nothing doing here, thought I. Except for a runny nose and a cold. I drove over the bridge and saw a Nankeen Kestrel hovering over the river, so I screeches to a stop and get out the camera, ready to rock and roll. But the kestrel flew off down the river and no photos. I drove down to the boat ramp and took some photos of some silver gulls flying around, moved further on and took some photos of some terns, then drove over to the Stockton Sandspit. There was a fisherman pumping for worms, a few Chestnut Teals, Australian Pelicans and this poor Pied Oystercatcher that had some fishing line wrapped around his leg. It seemed that the fishing line had cut off his foot and he only had a stump. It made me feel so sad and angry. I went down past the bridge and saw a few White-faced Herons and Australian Ibis hanging out on a a spit of sand to the east of the bridge. 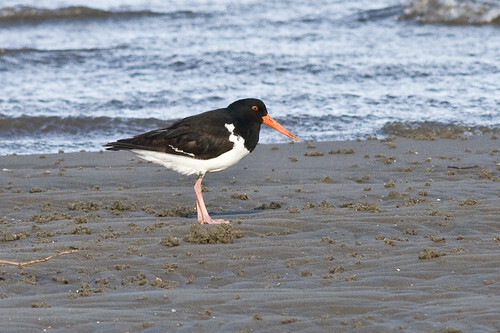 And here is a healthy Pied Oystercatcher. Well that is about it. Only one photograph worth posting. And a windy blustery day that I should have been indoors hiding from.